Ultratron thinks it's Dark Souls. 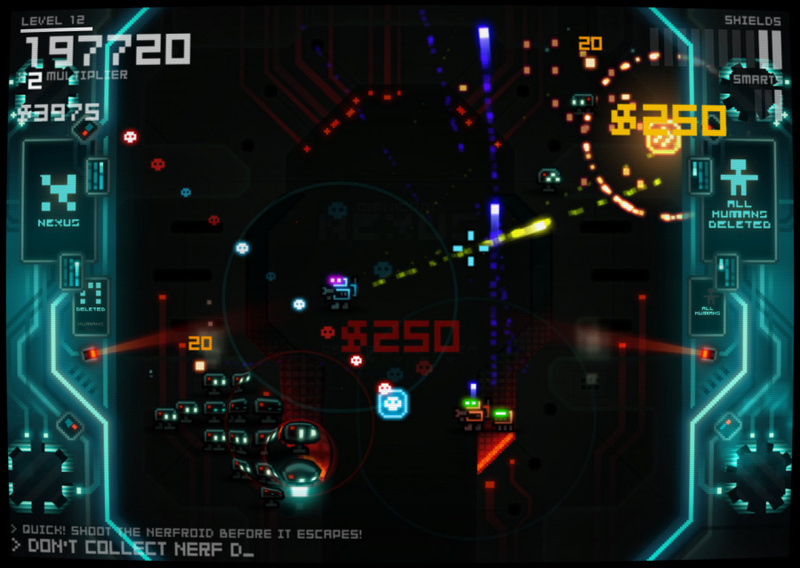 'Prepare to Die', it warns the player's battledroid before it takes to the battlefield in an almost impossible attempt to survive against a constant barrage of evil killer robots. Ultratron also loves Pac-Man. As well as having to collect 'pellets' as a form of currency in order to purchase weapons and armour upgrades, pixelated fruit will float across the arena, enticing the battledroid and forcing it to scurry through precarious, war-torn patches of turf, just for the love of bonus points – there's even a 'Pac-Mac' labelled upgrade, in case the previously mentioned references weren't subtle enough. Of course, Ultratron isn't either of these games and, in reality, it's merely paying homage to these classic games of the past that are known for their simple focus on beating high scores and extremely high difficulty levels. Ultratron is, however, a throwback to the arcade shooters of yesteryear – for the older generation think Smash TV, and for the twenty somethings imagine Geometry Wars: Galaxies. 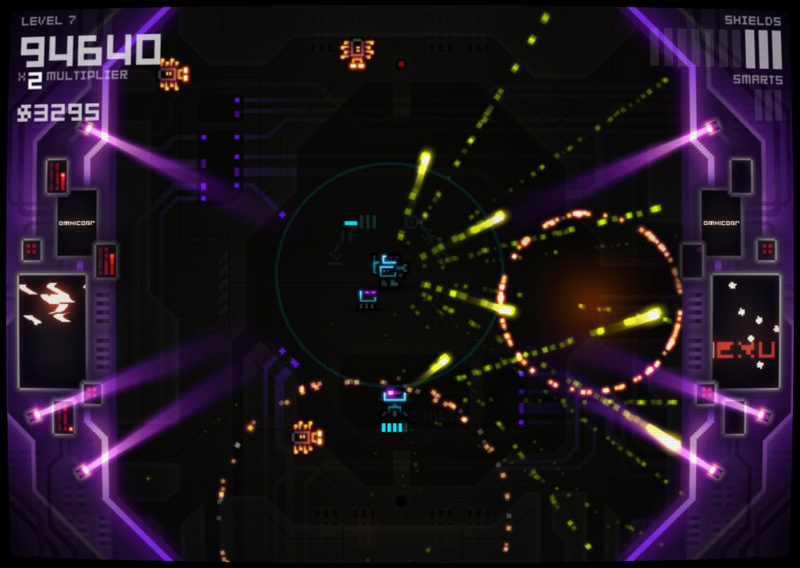 The developer behind Ultratron is Puppy Games of Titan Attacks fame, itself a modern throw-back with a similar visual style and hue. The studio has again managed to combine its own blend of old school gameplay with some original tweaks of its own; it's easy to foresee Ultratron becoming the go-to game for masochist gamers aplenty. As with all arcade shooters, the emphasis on story is null and the objective is simple - survive and rake up as many points as possible. 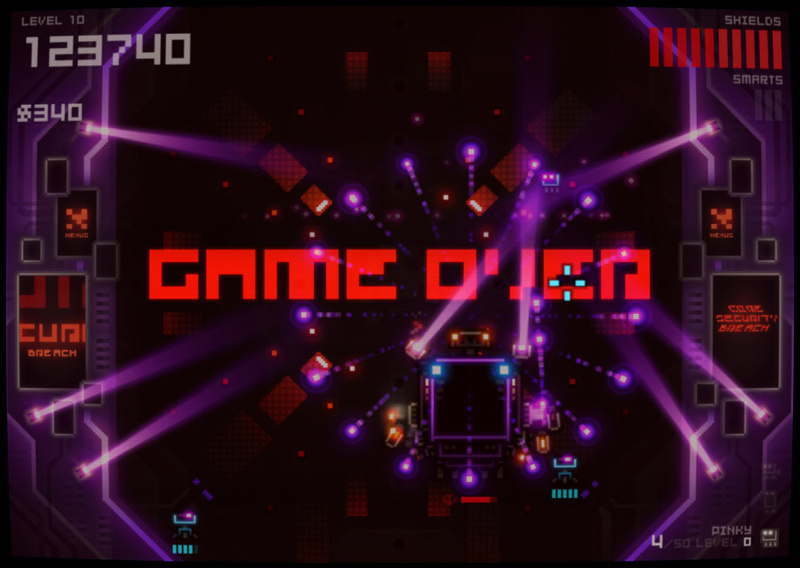 Throughout the game there are four levels, each containing ten stages, and at the end of each level the player is presented with the challenge of having to defeat a final boss to advance. A frenzy of different enemies will attack the battledroid, each with their own different attack, whilst others choose to work in set formations and groups. Surviving involves taking advantage of the twin stick set up; the left stick moves the battledroid around the stages and the right stick fires its primary weapon. With games such as these, it's the subtle things that can make a difference and the developer's approach to how and when upgrades take place is what sets Ultratron apart from other games in its genre. Collecting pellets after defeating enemies goes into the players' account and can be used to purchase a variety of upgrades at the end of each stage. This is game-changing as it allows players to take on levels in either a defensive and attacking manner, depending on their preferred style of play. For example, should players prefer to upgrade their battledroid's primary weapon and add turrets to its arsenal, they must sacrifice the defensive options at their disposal. However, there's also the option to stock up on lives – always useful, yet never cheap – thus forfeiting the aforementioned and a list of other upgrades. It's these little nuances that add a tactical edge to Ultratron, rarely seen in games of this nature. As for the bosses, although they make for tense battles, they all share a fairly similar design and other than forcing the player to continuously move and shoot, they don't require much of a tactical approach; this is surprising given the context of the game. The levels that make up Ultratron are consistent with the overall vibe and feel of the game, and although it's hard to criticise it from a visual standpoint it must be pointed out that some of the artistic choices can be the players' own worst enemy, rather than the enemies themselves. 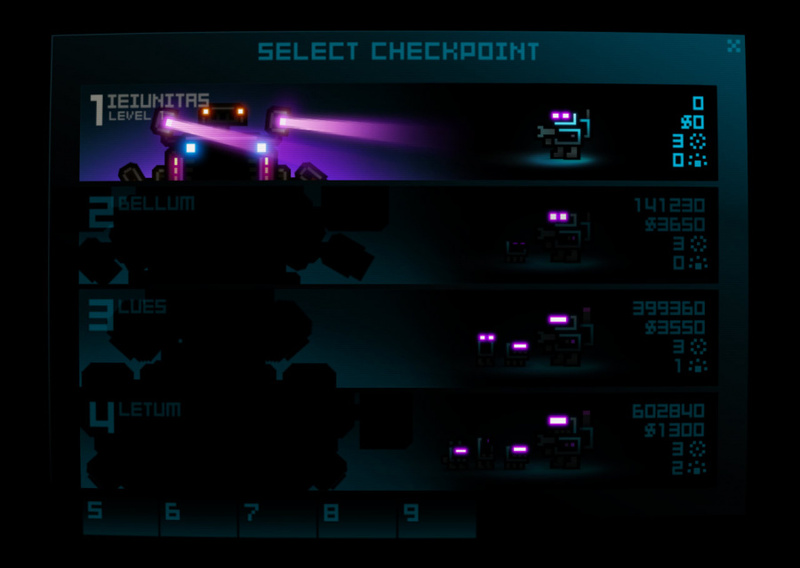 Opponents can be near impossible to see during levels 3 and 4, as they are the exact same colour as the levels and bullets that surround them. Losing valuable lives in this fashion feels cheap and it's likely that most lives will be lost during the closing levels due to this oversight. On a more positive note, the eye-popping neon lights are great to behold, and assuming the player is more focused on the overall experience other than trying to collect points and increase their world ranking, it's hard to fault what is certainly a unique visual spin on games of this class. The music suits the overall tone to perfection, and can possibly be described as pulsating techno with a vintage retro edge. As the stages become tougher and enemies become more relentless in their bid to annihilate the battledroid, the music almost seamlessly matches the mood, heightening the players' presumed already increased sense of anxiety. The soundtrack does have a tendency to become repetitive and more tracks would have been appreciated, but luckily, what is on offer is of a high quality. Sounds promising! Hopefully it's coming out in germany, as well. I love this game. Personally i give it an 8 out of 10. My grips are yes its hard to see but the pets are more of a set back and aren't worth using as they hold back your score. No mention of the similarities to Robotron huh. Even the name is a homage to it. Is it possible the reviewer isnt aware of Robotron?? The classic that it looks like was the actual inspiration for this game. Lol, he needs to go find Robotron and he will feel right at home after playing this game. I would also like to see what @Sean_Aaron thinks of this review and game in general. Those wanting to give this a go but are worried about not being able to see: you can turn off certain distraction effects in the options menu. It's not a night-and-day difference, and as the reviewer says, the backgrounds and enemies are strikingly similar but it does help. I've really enjoyed playing this on Wii U. Really does feel reminiscent of Robotron, albeit with a modern twist! The reviewer talks about lives but you only get one life. You can upgrade your shields and each hit depletes them. I'm guessing thats what he's referring to? I'll be picking this up tonight after work I've had a craving for shmups the last couple of weeks. You kids and your Robotron. Berzerk was were it was at. Loving it. Very old school blaster with the twist of the upgrades. As pointed out before if you turn off some of the visual effects on the menu it does become easier to see on the later levels. Also clearer playing on your TV than the Gamepad. I'm reticent to buy this. It is of interest to me, but I found Titan attacks a bit of a snorefest. Unsure. @rjejr You are no longer allowed to post links after that travesty! It already is out in Germany. There even is a special discount in the e-shop. I was trying to hold out for your review, but ended up purchasing it on Satuday on a whim and... I blepin love it!. Have not tested co-op yet, but next time I get a friend over, were giving this a go. Awesome game 9 out of ten for me. I am probably bias as I had the sixth best score for a bit. Probably destroyed by now. I would give it AT LEAST 8, probably even more when I get to play it in CO-OP. @Spoony_Tech - OK, no more posted links. @Spoony_Tech Well everyone has their opinions, though I will say that Smash TV was the 90s re-hash of Robotron which is a much tighter and more challenging game than Smash TV or this. I do enjoy Ultratron's retro charms which a lot of people get wrong and until Time Warner gets their finger out and treats the old Williams and Bally-Midway games with the respect they deserve I'll have fun playing it. I'll set it alongside XTYPE as king of the indie shooters on Wii U thus far and I didn't need to wait for a review either, it just looked quality from the outset. Might check this one out someday. @Tiefseemiez Huh, completely missed it. Thanks for the heads up! Nobody beat Williams when it came to sound effects and visual effects in these high intensity action games, though, like Robotron and Defender. Also, I really like Puppy Games but some of these games have been out for over a decade. They were some of the first to reinvent retro so they used to stand out back then. I used to play Titan Attacks in my browser somewhere between 2003 and 2005 I think. (Was pretty impressive to be able to do that back then). Revenge of the Titans is the one I've put the most time into. It's a tower defense of sorts and would be a good fit for 3DS or Wii U I think. @rjejr My older brother and I would frequently speak through a fan to get the correct sound for "By your command". @aaronsullivan - "My older brother and I would frequently speak through a fan to get the correct sound for "By your command""
Whew, for a second there I thought you were going to admit to saying your vows through a fan. lol. Did you ever check out the Ronald D. Moore Battlestar reboot? I liked it quite a bit, despite some missteps. I think you dig cheese a bit more than me, however, and I'm going to guess you prefer the original. I only played Venture a couple times in the arcade but learned to love it (and Cosmic Avenger) on the ColecoVision. It's amazing what the imagination did to games back, then. So, the Flashback is pretty good? I watched the trailer of this game a few days ago and I was impressed. It's no surprise the review turned out to reflect that as well! This is a cool game. Got it a few days after release. @aaronsullivan - The first 16 episodes of the reboot (cringe I hate that term) are possibly the best thing ever on tv. (It might be 18, if you saw it you know.) And then it turned into a war protest on Iraq, despite their protest to the contrary. Still a good show, but I stopped buying the DVD box sets. I own 1, 2.0a and 2.0b (or however they started breaking the season up). And the 1st movie series 4 hr thing, and Razor. I still recommend it to anyone who will listen, I just don't play it up as much. Galactica was good too, it should have been renewed. The original I think is still my wife's favorite show of all time. Right age right place I guess. Though even she has enough sense to disown '80. She also really likes the original V, and that reboot was k for regular tv. On a videogame note - ordered my kid the DI 2.0 Spiderman playset today on Amazon for $15.27. It was $15 the other day but it went OOS before my kid got home from school and I could confim it w/ him. (It's not just amiibo.) We played about an hour of Lone Ranger the other day, nobody told me we could ride on an elephant! So, as much as he's been waiting for Puzzle and Dragon Z Mario skin he said he'd wait on that and play this. I've taught my kids well. My oldest wanted PaDZ as well, but he said he'd rather buy S&S2 for $20 tomorrow. (If I were a kid w/ $250 in my wallet and no responsibility I'd buy it too.) The wife is currently opposed to Splatoon for $60 though. We'll see. Everything is fluid. I have Titan Attacks! on PSN and while I enjoyed it, I couldn't get into it. Nothing really stands out for why. But, as a part of the "older generation", growing up on games like Defender, I'll have to think about this one. @ChiefTrixter It's nothing like Nano. It's a one stage set up. Google Robotron and this is basically an updated version of it. So I bought Swords and Soldiers 2. Said screw it. Bought the first for $2.99 also so I figure it all averages out anyways. I read that article the other day and have been feeling guilty ever since. Also got Nihilumbra, and am debating on Ultratron (I wanna support Curve Studios for their quality games and regular Wii U support). And dear goodness man, Berzerk was your GotY back in '81 huh lol? You have commanded a whole new level of respect from me. Gamer badge reinstated! I really enjoyed Titan Attacks, so I wouldn't mind giving this one a try. @JaxonH - "Berzerk was your GotY back in '81"
Well to be honest, there wasn't a whole lot of competition in '81 b/c I was never any good at Defender. Phoenix was '80, Q-Bert '82 and Gyrus '83. After that I discovered girls and decided they were more fun to play with. @JaxonH - We're still leaning towards getting S&S2. I bought the U version for $3. And the Wiiware version for $10. And the PSN PS3 version for $10. And I think I spent another $1 on the iOS version back when I had an iTouch. So I don't feel like it averages out as well for me as it does for you. If I can convince my wife to let us get Splatoon next week then we won't, if my wife holds fast on no Spaltoon then maybe we'll pick it up. See what you do is pre order and when it arrives, "oops, I forgot to cancel it, oh well might as well play it since we own it now". @JaxonH - Can't pre-order though w/o permission. You've never been married, have you? Don't worry, I have you as my fall guy, remember when we became Wii U friends, I can make Splatoon all your fault. If S&S2 had online vs that $20 would go over better. @JaxonH - Sorry abut the divorce. Glad it wasn't due to pre-ordering, but I don't want to take a chance at being the first. It's all my wife's money, I'm a stay-at-home-dad, I always get her permission to spend it. Well except the $200 I get every year from relatives for my birthday, that's mine. Still debating the new 3DS XL. @rjejr That would be one for the record books lol. Woman divorces husband after purchasing video game lol. Hell hath no fury like that of a woman's scorn. @JaxonH - Well that would be the last straw. I'm sure men have been divorced for less. Not before the '60s, but in the 90s onward. You don't have to tell me- I heard of all kinds of crazy stories before. I have never been married but I know enough unhappy married men to notice that they cannot do anything without permission, or paying the consequences later. So I think that quoting the great Hank Williams "I'll be a bachelor till I die". @sinalefa - "so I can share the blame on that"
Yeah, but I wouldn't blame you, you're a nice guy, it's @JaxonH who's the trouble maker. @JaxonH - Took the weekend off, mostly, from NL and spent time w/ my family - parade, Met game - so I don't recall what you may have been teasing me about but you don't have to worry about that, we're good. Tease away, I'm still not playing DKCTF again though.